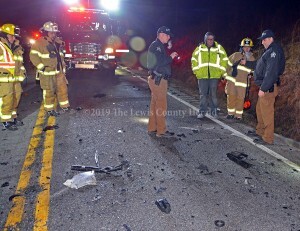 Officials examine the scene of a double fatality early Sunday on KY 8 at Black Oak. Officials are investigating a two vehicle collision early Sunday that resulted in the death of the operators of both vehicles. Sheriff Johnny Bivens said the crash happened about 12:15 a.m. Sunday on KY 8 just east of the Black Oak Industrial Park. Bivens said deputies responded to the scene and determined Kathy G. Hardy, 65, of Vanceburg, was traveling east on KY 8 in a 2015 Honda Civic while Arica J. Jarrells, 37, of Vanceburg, was traveling west in a 2008 Nissan Versa when the vehicles collided head-on. Both Hardy and Jarrells were pronounced dead at the scene by Lewis County Deputy Coroner Amanda Gaydos. An accident reconstruction specialist with the Kentucky State Police determined in his preliminary investigation that the Honda had crossed the center line and struck the Nissan, Bivens said. The roadway was closed at that location until about 8:00 a.m. to allow for the investigation of the scene and for the wreckage to be cleared. Assisting at the scene, along with Bivens, were Deputy Jason Bryant, Deputy Taylor Martin, Deputy Dennis Brown, Deputy Coroner Amanda Gaydos, Portsmouth Ambulance, Black Oak Fire and Rescue, Lewis County Fire and Rescue, Garrison Fire and Rescue, Clark’s Towing, and West KY 8 Towing. Gaydos said both victims were scheduled for autopsies at the State Medical Examiner’s Office in Frankfort. “Our thoughts and prayers are with the families of the victims,” Bivens said. Arrangements for Arica Jarrells are incomplete at Dickerson Funeral Home in Vanceburg. Arrangements for Kathy Hardy are incomplete at Gaydos Funeral Home in Vanceburg. The collision remains under investigation by KSP Trooper Jason Brown.